Our Brownfields Program staff are encouraging Washington communities to take advantage of the Building Blocks for Sustainable Communities Program. 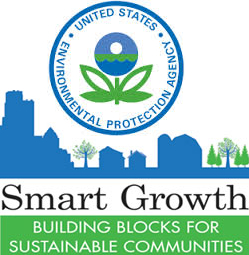 The U.S. Environmental Protection Agency (EPA) created the program for communities that are relatively new to environmentally sustainable approaches but have a basic understanding of smart growth principles and how they apply locally. EPA enacts this program by providing technical assistance workshops in selected communities. Their workshops are focusing on two tools this year. Communities with Superfund and/or brownfield properties are invited to apply for the Strategies for Neighborhood Reinvestment tool. A brownfield is a formerly abandoned property whose redevelopment may be complicated by actual or perceived environmental contamination. The tool will help them enact policies to increase the redevelopment potential of contaminated properties by creating better conditions for real estate investment in the neighborhoods surrounding them. Communities digging up and reconstructing streets are invited to apply for the Green and Complete Streets tool. The tool will help them capitalize on water infrastructure upgrades as an opportunity to rebuild more pedestrian and bike-friendly streets that better manage stormwater on-site. Select one of the tools described above. Describe the nature of the smart growth or sustainable communities-related challenge(s) facing your community, including any relevant data to demonstrate the challenge. If applicable, describe how this challenge affects low-income, minority, tribal, and/or other communities facing disproportionate environmental or health risks. For Strategies for Neighborhood Reinvestment, indicate what, if any, economic development is occurring in your community and steps your community has already taken to encourage infill development, including policies, code changes, partnerships, or other strategies. For Green and Complete Streets, preference will be given to communities that already have a Complete Streets policy in place and want to add the “green” element, so indicate how familiar your community is with Complete Streets practices as well as green infrastructure for stormwater management. Include local examples, if any. Describe your plan for engaging underrepresented communities, including low-income, minority, tribal, and/or overburdened communities, in the technical assistance workshop. Identify your preferred timing for the workshop. The proposed timeframe for these workshops is between March and September 2019. Please provide a preliminary idea of the best dates for your community. Describe the community’s expected capacity for implementation, for example, local policy change, additional consideration for physical improvements, new incentives, etc. EPA generally looks to assist communities that are ready to implement once the Building Blocks workshop and next steps memo are complete. If applicable, describe how this assistance would complement work being done in the community using other federal funding (EPA brownfields grants, U.S. HUD Community Development Block Grants, U.S. DOT TIGER/BUILD grants) and/or how this workshop would align with a local or regional planning process. Affirm that the community can provide the information or materials listed in the “What the Community Provides” section of each tool description. List the primary point of contact and other key stakeholders who would be involved in the technical assistance work, including title, address, email, and phone number of the primary contact. The letter must be signed by a mayor, city manager, elected official, or other representative of the community. This signature represents the community’s support and commitment to this program and assistance. The letter of interest must be submitted in an attachment (Microsoft Word or PDF file) by email to BuildingBlocks@epa.gov no later than November 16, 2018, at 2:00 p.m. Pacific Standard Time. Please save your file using the following format: Name of Jurisdiction Name of State and corresponding tool number (#x) based on the following list. For example: Catonsville Maryland #1. If you have questions about this request for letters of interest, please see EPA’s Frequently Asked Questions webpage. If your question is not answered there, please contact Chip Gurkin at Gurkin.Charles@epa.gov or 202-564-2778. At Ecology, we’re proud to help protect Washington’s environment and quality of life. We strive to promote the wise management of our air, land and water for the benefit of current and future generations.